A sinking minnow w/size and function appropriate for seabass fishing in bay area. Our pursuit for a size comfortable to use and a weight easy to cast both from shore and boat produced a sinking minnow of 78mm in length and 10g in weight. A minnow with fixed weight and low centre-of-gravity. Despite fixed weight, casting performance is great. SEA BAT starts to swim quickly even if you retrieve at the same time as the lure lands on the water, which ensures a hit which occurs immediately after casting to a pin spot. SEA BAT is designed for crisp wobbling roll action. Under steady retrieve, it accommodates any retrieve speed with excellent balance and stability. Flashing, which is released from its vertical flat side body, has a great appeal to seabass. 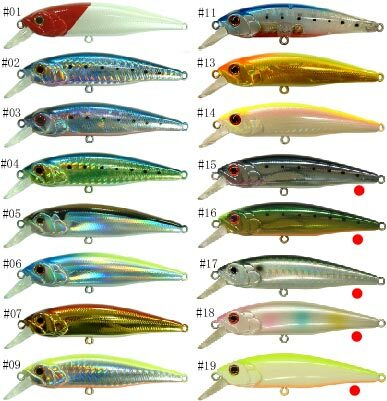 Hologram & metallic color for diffused reflection, combined with the body silhouette, makes the lure look like a real bait fish. The sinking posture, which is a vital factor in seabass fishing in bay area, is "a fall with parallel posture". SEA BAT, which is excellent in high response, is so quick in restorative force after dart action that it can instantly respond to straight retrieve immediately after continuous twitching.